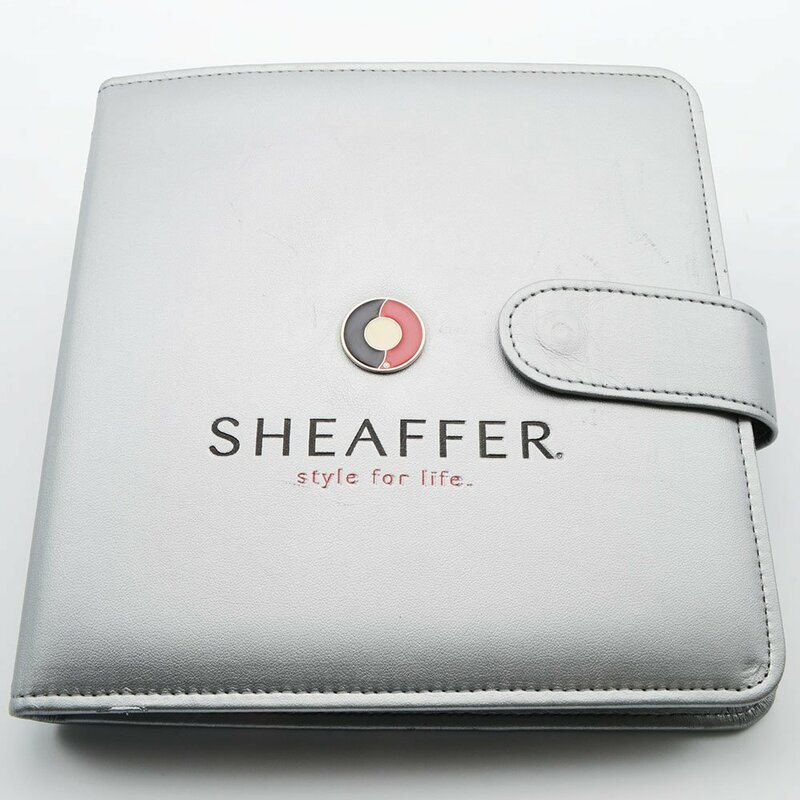 Sheaffer Pen Dealer Sample Display Binder from the 1990s in padded grey leatherette with Sheaffer lettering and a circular black and red emblem with white interior dot. Fully stitched around the edges and with a snap closure. Black six pen holder. In excellent condition. Product Name Sheaffer. Made in Canada. Dimensions 7-1/2 " long and 7-1/2" wide. The binder is stitched at 1/8" along the edges. The binder holds six pen samples, and it will hold a pen as long as 5 1/4"
Color Grey padded leatherette with "SHEAFFER" in black block lettering and "style for life." in red lowercase lettering just below. Above the Sheaffer lettering is a circular red and black emblem with a white dot interior. The binder has a flap that snaps to the front to close it up. The interior is a heavy grey lined silky paper on the left and a black, plush pen holder insert on the right. Condition Excellent condition. The front of the binder has some small scratch marks to the right, below and above the silver snap. The back of the binder has some vertical crease lines. The heavy silver paper on the inside of the binder has two noticeable indentations and a vertical pucker. The black plush pen carrier is in excellent + condition with just a little wear in the pen receptacles.